What’s Red & Green and deliciously detoxifying? Why a beet and spinach salad of course! 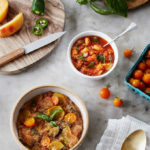 Bringing together three separate components that are each made on their own, means that this salad can be combined in a couple different ways. I love options! And I love foods that can be made in advance and stored separately to combine for a quick dish. You can serve this salad hot or cold, with easy instructions for both. 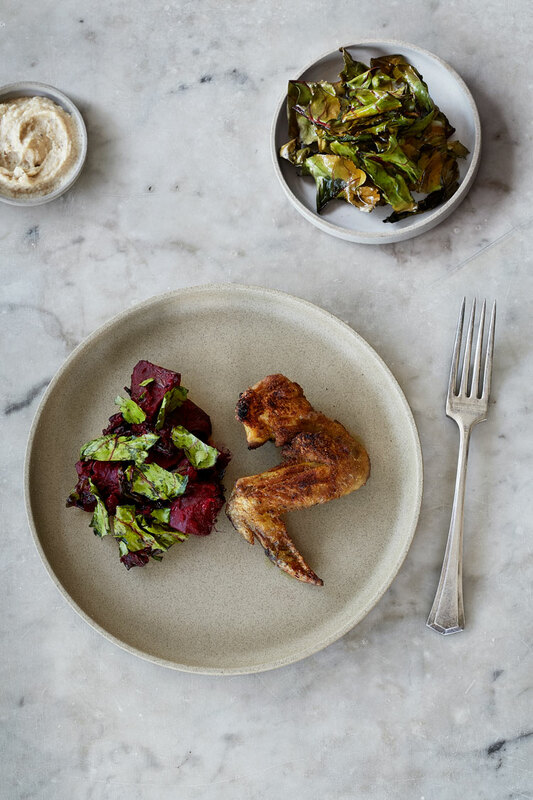 I love the way the beets and the other elements look when plated cold (like in the photo with the dramatic beet crisp positioned in the middle,) but I do prefer the warm version with wilted spinach (like in photo with the curry chicken wing). Perhaps it’s the time of year, or perhaps I’m partial to cooked greens. 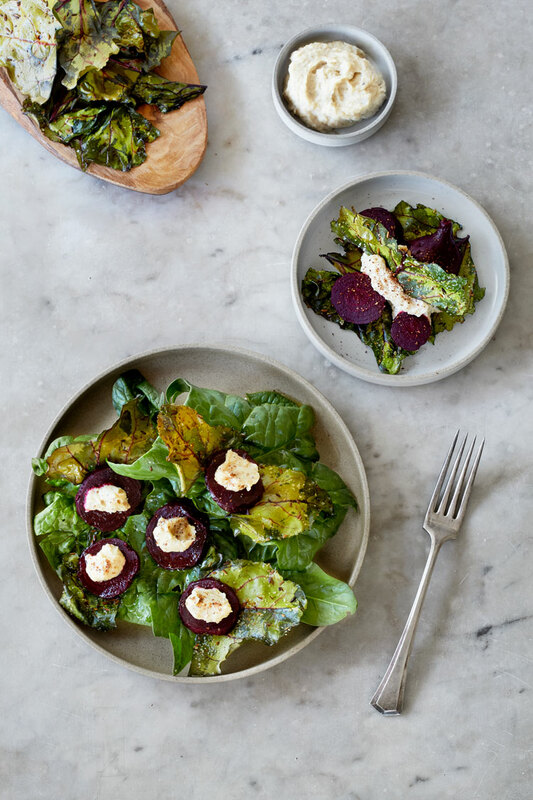 In either case this dish is a fun way to incorporate lightly cooked, highly detoxifying and blood purifying beets into your routine, or to serve as a healthy dinner party side dish. You can really have a lot of fun with presentation here! If you’re cooking all three of these elements at the same time, the whole process should take about an hour. You could also make the Celeriac Purée or cook the beets at different times, as both will keep well in the fridge. The Beet Top Chips are good the next day too, and will hold a crispy texture as long as you don’t store them in a sealed container. You’ll do best to leave them out at room temperature under a mesh strainer. The only specialty ingredients in this recipe are the Za’atar spice and my recommendation for a truly high quality Extra Virgin Olive Oil. 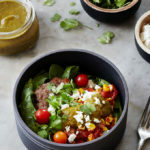 This Spicely Za’atar is incredibly delicious and gluten free! It’s not a big package, but worth every penny. 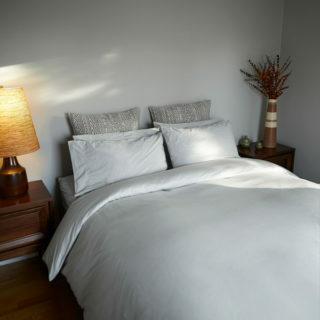 For Olive Oil I recommend Bariani – a single source olive oil made on a family farm in Napa. 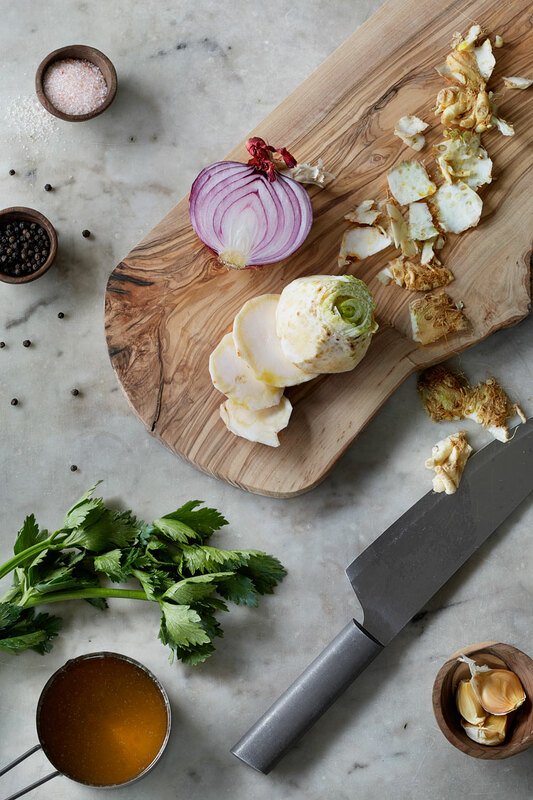 These ingredients are key to the creating a flavorful and healthful dish! Simply rub the meat under and over the skin with liberal amounts of your favorite curry spice mix and some salt. Place a spoonful of coconut or avocado oil in the pan. Fry on medium heat for 5 minutes on each side. Then bake in the oven, skin up, covered for 25 minutes at 350F. Remove lid and broil the skins to regain crispness for about 5 minutes – keep an eye on it. This fun and festive salad combines raw spinach with cooked beets, a creamy dip and a crispy garnish. A simple dish that looks a little fancy. Makes for great presentation, served as a warming side or starter salad! Scrub and place beets into a pot of boiling water. Cook for 15 minutes on medium heat. Remove from heat and drain. Let cool and slip skins off with your hands. Or peel skins under cold running water. Slice beets into desired style chunks or slices. Wash spinach. If leaves are mature or large, consider chopping into smaller pieces. Plate greens and beets, then drizzle with Extra Virgin Olive Oil. 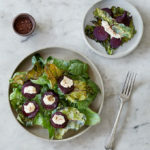 Place dollops of Celeriac Puree on beet slices, or in the center or side of salad. 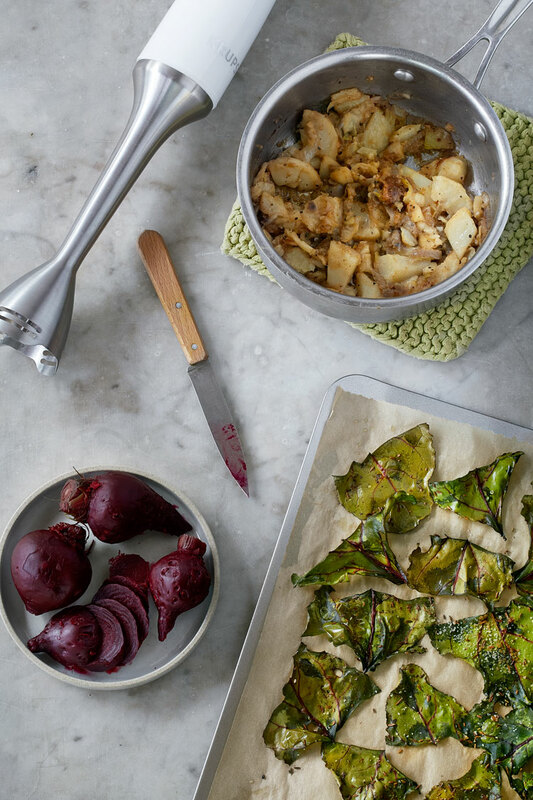 Top with Beet Top Chips, whole or crumbled. Dust with Za'atar and a touch of sea salt. 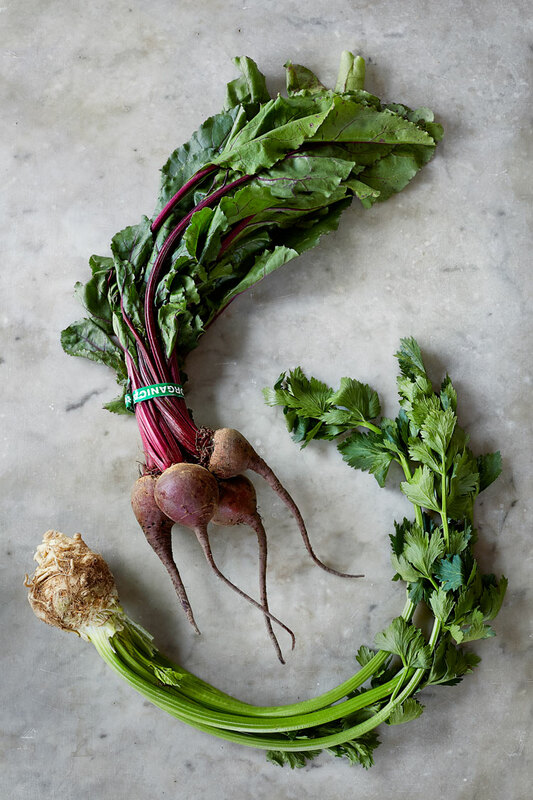 Toss chopped beets, 2 bunches chopped spinach (or whole baby spinach) and Yin Yang Celeriac Puree Dip into a pot and stir well. Warm on medium-low heat with lid for about 7 minutes, stirring occasionally, until warm and spinach is soft. 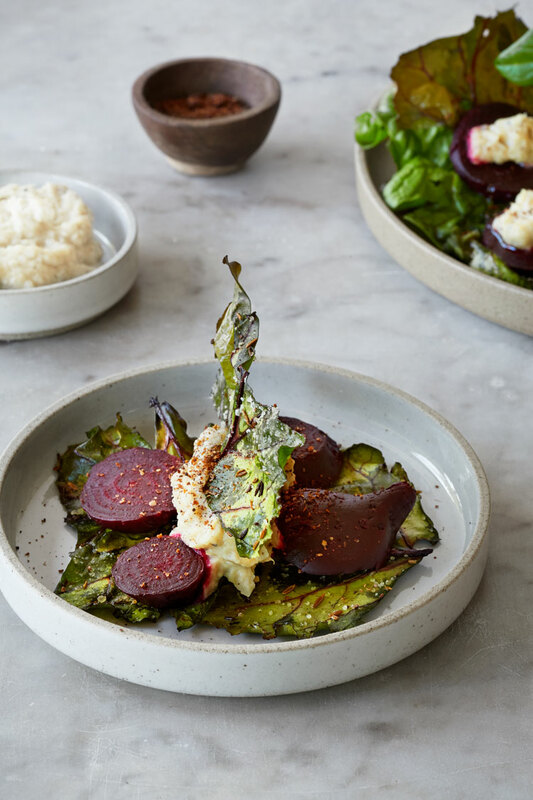 Serve garnished with Beet Top Chips and Za'atar.